A brewery must change the can design for one of its beers after it was deemed "too attractive" to children. 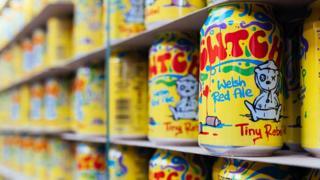 Newport's Tiny Rebel had a complaint made about its Cwtch beer, which features a cartoon bear and graffiti. Alcohol industry standards body the Portman Group ruled it breached packaging and marketing codes. Brewery co-founder Bradley Cummings accepted the decision and said minor changes would now be made to the drink's packaging. One complaint was made by a customer who said they bought the beer thinking it was a fizzy drink and thought the can "looks very similar to Sunkist". Tiny Rebel argued the psychedelic pattern was inspired by the Austin Powers films and the bear was "a manifestation of the two co-founders' personalities". The Portman Group's independent complaints panel agreed the packaging could appeal to under-18s and encourage "immoderate consumption". But it rejected two further claims it could encourage antisocial and violent behaviour and did not state it was an alcoholic drink clearly enough. John Timothy, secretary of the independent panel, said: "While it was clearly not the intention of the producer to promote immoderate consumption, even indirectly, companies have to be extremely vigilant around themes that could be attractive to young people, particularly when designing 33cl cans which, in the UK, are traditionally associated with soft drinks." Mr Cummings said: "We've worked with the Portman Group and the result of our chats is a minor change to our Cwtch can product by making our logo less dominant on the front of the can."